Luxury condo with pool close to Disney and championship golf courses. 3 bedrooms, 2 bathrooms, sleeps maximum 6 adults plus 2 children or 7 adults. Whether it’s the enchantment of Disney Word, the thrill of the famous shopping malls, the world class golf or even the simple pleasures of the breathtaking Florida sunshine that attracts you to Orlando; our condo at Terrace Ridge is the idyllic home away from home from which to enjoy your Floridian dream. Situated close to Davenport in the tranquil gated community of Terrace Ridge and set amidst the beautiful Florida countryside, it is just minutes away from all major Orlando area attractions, theme parks, championship golf courses and amazing shopping. 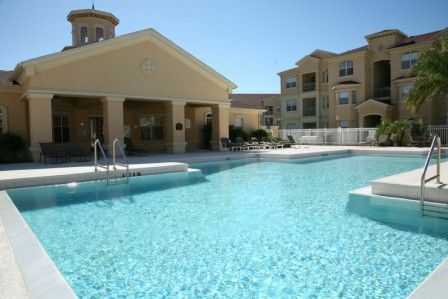 Also, our rates are all inclusive of utilities, pool heat, and use of all the community amenities. *Spacious 3BR,2BA condo with 1540 Sq Ft of air conditioned living space. Both our condos now benefit from being re-carpeted throughout in 2015 and replacement double glazed windows being installed May 2016. A all beds have been replaced with new comfortable mattresses to rest those weary limbs after an exhausting day at the parks! *Complimentary High Speed wi-fi Internet Access and Cable TV. *Complimentary national calls to landlines and cell phones and international landlines. *Complimentary use of two way radios for use at the parks etc. Our beautiful family owned luxury condo offers 3 bedrooms - 1 king, 1 Queen and 1 twin bedded room. The master suite has a walk-in closet and en-suite bathroom with walk-in shower and twin hand-basins. All bedrooms have flat screen HDTV's, alarm clock/radios, ceiling fans and ample closet space. The large family bathroom comes with bath tub with shower over and twin hand-basins. The living and dining areas come complete with all the necessary items to keep everyone happy and relaxed after a hectic day, especially the kids with Verizon FiOS flat screen HDTV, DVD/VCR with films, mini stereo and PS2 with games. The balcony of this tropically decorated condo is perfect for sipping cocktails whilst watching another magnificent Florida sunset. There is a fully equipped kitchen for preparing that gourmet meal or just a light snack. The laundry room complete with washer, drier and other cleaning equipment is adjacent to the kitchen. All linens and towels are provided including extra pillows for the bedrooms and separate towels for use at the pool at Terrace Ridge. The Terrace Ridge Community facilities include luxury Clubhouse with Fitness/gym room, games room, bar/kitchen area, relaxing lounge with 42' LED flat screen HDTV with Verizon FiOS channels, large heated community swimming pool, heated spa and sand volleyball court. All these facilities are Free to all our guests. We have a very professional management company who keep our home in excellent condition at all times and are always on call 24/7 if required in emergency. Please note that our condo has a strict No Smoking and No Pets policy. So why not come along to our home at Terrace Ridge so we can be part of your holiday of a lifetime. Whether it’s the magic of Disney and Orlando’s other fantastic attractions, serious shopping or championship golf we are only minutes away. Wi-Fi, high speed fiber optic broadband. There are 2 elevators serving each building. The living room contains two comfortable sofas seating five plus and accent swivel armchair. The larger of the sofas is a sleep sofa suitable either for 1 adult or 2 children only. Perfectly located property for all theme parks which was our main aim! Lovely condo with everything we needed. Family bathroom cupboard wasn’t very clean but otherwise spotless and well equipped. Great size pool for cooling off in. Could not have worked out any better. We came to the Orlando area for our daughter’s wedding and some relaxation. The condo was wonderful! The rooms were large, the beds were comfortable, the kitchen had everything you could need. There were a clothes washer and dryer too. The pool was amazing! So warm and relaxing with plenty of deck room! I would definitely recommend a stay here! This is a very nice condo, very clean and well kept up. We thoroughly enjoyed our stay at Terrace Ridge. The only things we might want improved was that the mattress on the queen bed was very soft and had a hole in the middle. I believe in another review it said that they would have liked blankets for the beds, and we agree - there was only the bedspread and a sheet. The spread did not work well to cover with and it would have been nice to have a light blanket. It was also a bit over decorated - way too many decorative pillows and artificial plants that we needed to put away so that we could actually live in the condo without it being so cluttered. But overall a great place to stay and a wonderful experience. We spent 3 weeks in the condo,it was very roomy and comfortable. We are a retired couple so not big into Disney. We did find several good restaurants and bar and grills that were good. This would be an ideal location for family wanting to do Disney and the other theme parks. The traffic can be a problem depending on the time of day you are out. We would probably use the condo again if we are going to be in the area. The owner sent very good direction and was very helpful through the entire rental process. Situated in the tranquil gated community of Terrace Ridge and set amidst the beautiful Florida countryside, it is just minutes away from all major Orlando area attractions, theme parks, championship golf courses and amazing shopping. Also, our rates are all inclusive of taxes, pool heat, and use of all the community amenities. Rates are fully inclusive of utilities. A $95 cleaning charge is added to all bookings. A 25% NON-refundable deposit together with a completed booking form required to confirm a reservation. Balance is then due 8 weeks prior to arrival. A $250 refundable security bond required.